Costa Rican guide Maurice Motte Simpson guarantees that those who sail along Costa Rica’s Sarapiqui River won’t spot any velociraptors. But that doesn’t mean they won’t see any large predators, as they ply the waterway. 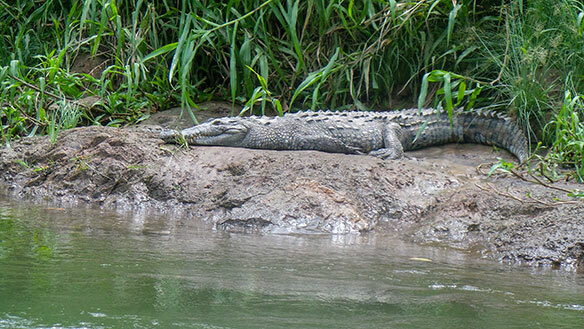 Motte Simpson – with tour company Aventuras del Sarapiqui – says Costa Rica – the setting for Michael Crichton’s classic novel Jurassic Park – is home to a huge number of wild animals, some of which can be seen by those who travel the Sarapiqui in open-air boats used by local tour companies. And among those creatures that can be spotted are crocodiles, which like to bask in the sun on riverbanks. “Tourists like to see crocodiles,” says Motte Simpson, who says he wouldn’t swim near the carnivores. The crocodiles can be aggressive, he says, although local children can be seen swimming in the river. The crocs don’t react to passing boats, apparently used to them. Motte Simpson concedes that not all those who he hosts feel comfortable knowing there are crocodiles nearby, although he insists they have nothing to fear. “Some of them are nervous, but they’re on the boat,” he notes. More information can be found at www.sarapiqui.com .